George Washington Carver was a famous scientist, humanitarian, and artist who arrived in Winterset in 1888. He lived in Winterset before going on to earn his college education in Iowa. The Carver Park in Winterset was dedicated 25 years ago to memorialize the inspiring story of this well-known American citizen. Carver Park stands next to the former hotel where he worked (which is now the Winterset Fire Station) and includes a memorial marker, short walkway, and flowers. 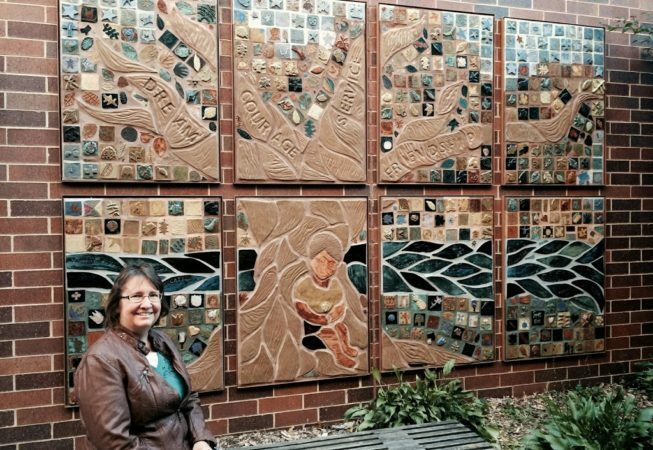 A ceramic mural created by hundreds of Madison County students was installed in the Carver Park in 2014. This public art project, the garden, and the limestone monument represent Carver’s love of nature and art, his philosophy of service, and the story of how the people of Winterset encouraged him to reach his dreams. A display about Dr. Carver’s time in Winterset and beyond can be found inside the Winterset Art Center.